The Irrigation Technology Center was approached to assist in the design and implementation of an irrigation system in a drought tolerance study. 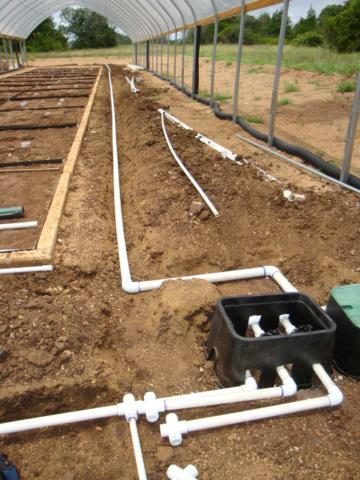 The irrigation system contained multiple design restraints which include little to no available water pressure due to treatment of water and no electrical power available on site. A solar powered pumping plant was designed to deliver water from a storage take to the irrigated treatments. A solar powered irrigation controller was also selected to operate the irrigation system. Design restraints also stipulated that treatments were to be irrigated simultaniously. The treatments were housed under a “rain-out” shelter to prevent rainfall from reaching the plants. Irrigation for the 6 different treatments ranged from simulated rainfall to little or no irrigation (drought-like conditions).